Nutrition plays a very large roll in your health and fitness. Unhealthy eating habits have contributed to the obesity epidemic in the United States and especially in the fire service. A poor diet is associated with major health risks that can cause illness and poor performance when it counts. Poor nutrition can contribute to heart disease, diabetes, hypertension and numerous types of cancer. Let me repeat that…. Poor nutrition can contribute to heart disease, diabetes, hypertension and numerous types of cancer. Currently, in the fire service, the number one reason we die in the line of duty is sudden cardiac arrest. Also, the number of strokes and incidences of caner are growing at alarming rates. In the fire service we are taught to risk a lot only when you can save a lot and to always “minimize the risk” whenever we can. So, with that in mind, does your nutrition minimize your risks? Eating healthy in the firehouse can be difficult. There is always an abundance of sweets and good tasting foods. Now, just because they are there, does not mean you have to eat them. I know, easier said than done. But, one way to help you avoid all of those “not-so-healthy” food choices is to have readily available “healthy” options. Here are 10 snack options that help me make (most of the time) better food choices in the firehouse (and out of it). #1. Nut Butter (peanut butter)Boat– Any vehicle for nut butter is a good option in my book. Try loading a few celery sticks with a serving of any nut butter (like almond, cashew, walnut) topped with a few whole almonds or raisins. If you’re not a fan of celery, try scooping out the middle of an apple and filling it with your nut butter of choice. Just make sure to mind the serving size of nut butters, they are usually a little higher in calories so make sure you do not over-indulge. #2. Jerky– Low-sodium, natural, or lightly-flavored options are a great source of protein, this chewy snack is also keeps fresh for months when packed properly. Jerky made from beef, chicken or turkey is both perfectly portable and packed with protein. A vacuum-packed package of dried meat doesn’t take a lot of space and won’t stink up your bag when you’re on the go during the day. Just be sure you pick a low sodium and low sugar variety, many companies add both to their products to amp up the taste. #3. Mixed nuts- Mixed nuts provide an easy way to get a delicious dose of protein in a convenient, shelf-stable package. Try a mixed bunch for variety and a combo with dried fruit for some added sweetness. There are some great single serving options for almonds and nut packs that can easily be carried on the truck and used when needed. What are the best kind of nuts? Almonds, pistachios and/or walnuts are a great choice, they’re higher in protein than their nutty peers. Again, use caution with nuts and mind the serving size. They are highly nutritious and also highly caloric so a little goes a long way but you have to make sure to abide by the serving size. #4. Nutrition Bar- There are a lot of different bars on the market, it seems that a new one emerges everyday. Thanks to great packaging and marketing most of them appear to be healthy but many are not. Look for bars that contain less than 200 calories and read the nutritional labels, go with the bar that offers more fiber, less sugar, and adequate protein (about 5 to 10 g). In the ingredients list look for more natural sugars—for example, evaporated cane juice or honey—than added sugars. Also, look for nuts to ensure the bar’s fat content is from a healthy source. I like to keep a couple bars stashed in a pinch to avoid reaching the “hangry” status. I like to use the Simply Protein Chocolate Mint Whey Bar, and/ or Almond Walnut Macadamia with Peanuts KIND Plus Bar. #5. Hummus and Veggie Dippers- In addition to protein and fiber, the chickpeas used in hummus are high in iron, folate, phosphorus and B vitamins. Throw in the vitamins from the veggies and you have a very nutritious snack. Here is a great unconventional way to create your own hummus and veggie dipper. Put a few dollops of your favorite hummus in the bottom of your favorite travel coffee mug (minus the coffee of course) or a mason jar, and then stick a handful of vegetable sticks (carrots, celery, and snow peas are a great mix) vertically in the hummus, screw on the top, and throw it in a bag or on the truck. This is a an easy and healthy on-the-go snack option. There are also some hummus and pretzel combinations that can also be used in a pinch. Personally, I like the roasted garlic or sun-dried tomato options. #6. Greek Yogurt and fruit- There are many yogurts on the market, and plain, nonfat Greek yogurt is a great snack option. Greek yogurt is an excellent sources of calcium, potassium, protein, zinc, and vitamins B6 and B12. It also contains probiotic cultures and is lower in lactose and has twice the protein content of regular yogurts. The plain yogurt is low in sugar and taste great when paired with the natural sweetness of fresh fruit. In addition to having all the essential amino acids, yogurt has both quick-burning whey protein and the more slow-acting casein, a sure-fire win when it comes to muscle recovery. I like the Dannon Light and Fit Greek with Zero artificial sweeteners, it already has the fruit in it and is in a single serving package. #7. Chocolate Milk– No, we’re not going back to preschool. But chocolate milk is actually a great source of high-quality protein (especially post-workout or post- fire). Try keeping a single-serving, shelf-stable box in your gym bag or backpack to combat against snack attack emergencies. Make sure that you find a brand that is low in sugar and don’t over-indulge, keep your servings small. #8. Grape-and-Cheese Sticks- This is a great option for your crew or kids. Dice a half-inch thick slice of cheddar or mozzarella cheese into squares (you should end up with about 6 small pieces), and alternate the cubes with grapes onto toothpicks. The sweet and savory contrast of the cheese and fruit tastes good, and a little bit goes a long way to fit your protein needs. #9. Hard-Boiled Egg (1 egg)- At only about 70 calories, an egg is a protein-rich, low-calorie bite. The yoke is high in choline, which may lower cardiovascular disease and breast cancer risk (very important for firefighters), and also contains leutine, which promotes eye health. Boil a bunch at the beginning of the week, then when hunger strikes peel an egg for an easy, nutritious snack. I like to keep a bunch in the fridge at the firehouse, next time you need a quick snack, reach for the egg instead of a baked good. #10. Canned Tuna on Whole-wheat crackers– If you don’t want to incorporate dairy into every snack, a can of tuna (packaged in water) is another great source of lean protein plus healthy Omega-3s. For about 200 calories, you can enjoy 3 ounces of light tuna and 6 whole-wheat cracker—complete with 3 grams of fiber and 20 grams of protein. Avoid the temptation to add mayo, try some relish instead to keep the calories a little lower. Obviously there are other options but I hope these 10 will give you enough options to stay on-track with your nutrition. The main thing to remember with good nutrition is to plan ahead and prepare! Let me know if you have a favorite option that I left off. Looking for some easy-to-follow eating guidelines to help you get lean and strong for the fireground? 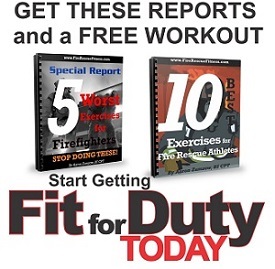 Right now with every FRF workout purchase you will get the FRF Standard Operating Guide to Eating Lean in the Firehouse and our Firehouse Healthy Recipes Cookbook. Learn how to Eat to Perform Better on the Fireground. Click here for more information!